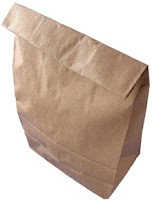 Take three people out of the room and tell the crowd to ask questions to figure out what's in the bag. Crowd knows it's toilet paper/underwear. Kid comes in and is told to really sell what's in the bag without giving away what it is. Kid is told while out of the room that he's selling something like gum. Fire him up to go for the hard sell.